A luxury rental villa look over Andaman Sea! 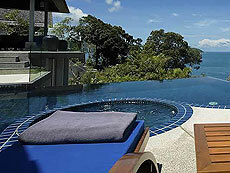 Villa Viman is a luxury rental villa in Samsara Estate at Kamala area in Phuket. The villa on a dramatic hillside seafront spot with 6 Bedroom, living, dining, 14 meter of infinity-edge swimming pool, game room... and the other many facilities with comfortable furnishings. The villa structre with full of great ocean view and open feeling is ideal for groups and families stay in Phuket.